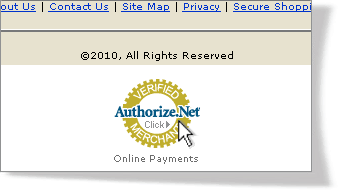 Displaying the Authorize.Net Verified Merchant Seal on your Web site is one of the quickest and easiest ways to create customer confidence and potentially increase sales – and it's free! Boost Shopper Confidence - Reassure consumers who may be concerned about the security of making online purchases. Reduce Cart Abandonment - Cut down on shopping cart abandonment due to security and trust concerns. Increase Credibility - Align your company with one of the industry's best known payment brands.